Generally speaking, the folks who visit botanical gardens fall into two categories. The first includes local residents who can best be described as garden enthusiasts – the sort who visit monthly, weekly or even daily to follow the lifecycles of favorite trees, shrubs and plants and can spend countless hours observing the diurnal operations of flowers or of the birds who come and go as a year progresses. The second group, generally larger and often much larger, includes local residents who stop by the gardens only when friends or relatives are in town as well as travelers who have some free time while in the area for a few days on business or a vacation. These visitors tend to be on the move, seeing as much as they can in the few hours they can reasonably dedicate to such an occasional exercise. Another contrast: The garden enthusiasts tend to be garden members – patrons who pay a fairly modest annual fee to gain easy, unlimited access to the gardens – while the occasional visitors pay significantly higher single-day fees and as a result contribute the lion’s share of the gardens’ ongoing turnstile revenues. In my first botanical garden projects (described in Part 1 of this three-part series – click here), I learned a lot about theming and the practicalities of working with garden staff. But I also became aware that a botanical garden is a business: As this new article discusses more directly, while a garden’s board of directors might rely heavily on large donations from corporate entities, they also need gate receipts to keep the lights on! My experience a few years ago at the Naples Botanical Garden was great training in what all of the above means. By the time our work there came to its conclusion after many phases and many years, I had effectively run through a master class in botanical-garden dynamics and what it takes to satisfy all of a garden’s prospective users. In the runup to this project, the garden’s board and its director, Brian Holley, had undertaken a complete revision of the facility’s master plan, pulling together their Dream Team – landscape architect Ellin Goetz, architect Ted Flato, landscape architect Herb Schaal, landscape architect Bob Truskowski and architect/landscape designer Made Wijaya along with me – to rethink and reconfigure approximately 170 acres of available space. The garden’s general mission was shifting to focus on representing plants found between 26 degrees north and 26 degrees south latitudes, so there are sections devoted to Florida, the Caribbean, tropical Asia and Brazil – all of which were of keen interest to me. Given my local expertise, my opening assignment was the Florida Garden. As I dug into the design work and a plan evolved, I decided that I wanted to donate a large tile mural by my friend, the late, great environmental artist Roberto Burle Marx, and install it as a key focal point. The board of directors was happy to accept the gift, but they jumped at the opportunity to include it not in the Florida Garden, but in the Brazilian Garden instead and asked me to shift over to that project. I was happy to oblige. Between the excavation for the two-tiered pond and the construction of a terrace intended to host a large tile mural by Roberto Burle Marx, the construction phase for the Brazilian Garden at the Naples Botanical Garden was quite intense – and that was before we added in a system of concrete walkways in a gesture to Burle Marx’s Modernist inclinations. The main feature here, I decided, had to be water. I knew it would be easily accessible as a practical matter given the high local water table, but there was some resistance to the idea of establishing a wetland area along with a pool of open water because of concerns over the bugs that would be attracted to the space – particularly mosquitoes, the bane of outdoor living in the region. In fact, this is a common source of concern in Florida watergarden design, despite the fact that the Everglades National Park is there as proof that people will put up with anything in exchange for seeing great natural beauty. I’ve spent years fighting for greater acceptance of this pure, water-centered approach to regional style and managed to win the argument here. In organizing the Brazilian space, I was given an acre and a million-dollar budget and was told that there had to be enough to see and do in the assigned area that occasional visitors (as described above) would spend about 20 minutes to take it all in. Our work began with removal of invaders, retention of appropriate natives and in deciding on which representative Brazilian species we’d introduce to the mix. Moving forward, my plan gradually expanded to cover two acres. When the board heard about it, they slapped my wrist and said no. But then, as a consolation prize, they gave me an extra $200,000 in my budget, so I guess being ambitious had its benefits. With the funding in place, work began in earnest and the Brazilian Garden took shape. Originally, we had planned on using the native oolite limestone we’d be excavating to form our lake in creating pathways, but we soon changed directions and went with concrete instead: For one thing, concrete was the less-expensive option for all sorts of reasons; for another, it would give the space a distinctly modern look, which made sense given my desire to set the overall space up as something of a tribute to my Modernist mentor, Burle Marx. As the plan developed, we included botanical representatives of seven Brazilian ecosystems we knew would thrive in the Naples climate and made specific selections based on a plant’s need for conservation and on a range of aesthetic factors related to visual compatibility, height, color, texture, fragrance, growth pattern and more. In addition, we pursued species with great narratives with the goal of inviting visitors to explore the mysteries some of these plants embody. Given its elevated position atop a staggered waterfall and the fact that we kept sight lines open to it from a number of key spots around the garden, the Burle Marx mural is truly the beating heart of a space that’s now home to a number of plants selected from his own historic nursery in Brazil. It was in this spirit of exploration and education that we devised the watergarden’s elevated plaza, which backs up against a large conservation area and includes the eight-by-17-foot mural mentioned above. This ceramic-tile composition had long been one of my prized possessions, but the thought that it would find a home in such suitable surroundings pushed me in this direction – and now it is the only public Roberto Burle Marx mural in the United States. As for the pond, blue skies now reflect off of its dark, placid surface before it tumbles down from the upper watergarden via a multi-tiered waterfall into the lower pond. The plaza beyond is now a vibrant gathering space offering great views of the water and its planted margins in the foreground with a long view to the Visitors’ Center beyond. It’s all set up in a way that creates visual links between all key features of the Brazilian Garden. 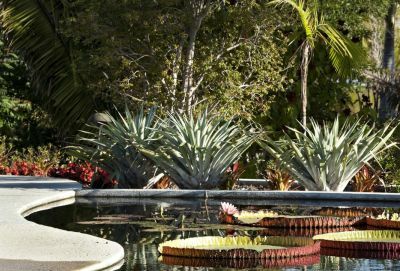 The sweeping, voluptuous contours of the Brazilian Garden’s pond are lined with terrestrial plants of varying sizes, shapes, colors, textures and fragrances, but many of the stars of the show are in the water, including the gigantic Victoria Amazonica water lilies. So now, as the sun sets behind the vine trellis on the plaza, the hues of the sky mimic the hues of the mosaic tiles. As the light fades and the garden’s visual elements drift away, the sounds of water create a nighttime haven for those who find comfort in the darkness. It’s a sensory delight, a place for recreation, contemplation and education for present and future garden visitors – and well worth a pause lasting more than the programmed 20 minutes! Indeed, the plaza has become one of the gardens’ prime gathering spaces, hosting painting workshops, yoga classes, jazz concerts – even movie screenings. And it’s isolated enough that all of this can happen without disrupting the reveries of those visiting other areas of the garden. And then there are the plants, of course, many of them sourced from Burle Marx’s own nursery near Rio de Janeiro. The specimens include huge Victoria Amazonica water lilies, epiphytes, vines, orchids, Brazilian palms and trees on beautiful display. As this work was concluding, garden officials approached me about a second project having to do with the Visitors’ Center. There was a sense that its surrounding areas weren’t coming into focus as desired, and they asked me to prepare some drawings they could use to generate enthusiasm – and organize another bit of funding to pay for what I might have in mind. Once that exercise ended, attention shifted, again unexpectedly, to the Florida Garden. It had been assigned to another designer when I tackled the Brazilian Garden, but it wasn’t coming together the way anyone wanted it to, particularly given the prominent place it rightly would occupy in a Florida establishment. There was just no there there, and the board wanted me to get it back on track. The scope of my work on the Visitors Center was limited to a number of drawings intended as fundraising tools. When the structure was actually built, one of its prime terrace views reached across the entry plaza and over to the alluring prospect of the Burle Marx mural in the Brazilian Garden. As part of the new master plan, the gardens include a River of Grass that flows from the Visitors’ Center and passes by the Brazilian and Caribbean gardens on its way to the Florida Garden. Once the main path reaches the Florida garden, we slowed things down by splintering the broad avenue into smaller paths that meander through the space. Another strategy we used here was a bit different: Florida is an exceptionally flat place, but we introduced elevations and undulations that went about as far as ADA access rules allowed us to go. This let us control views and set up little revelations as the paths snaked their ways up and down through the space. And once again water is at the heart of the garden, with an overlook that provides an excellent prospect not only on the small pond we included, but also out to a larger lake beyond. It’s my firm belief that gardens are best experienced through movement rather than from fixed perspectives, so wherever we established viewpoints, we also used these vantage points to create invitations to move along and get closer to details that are first seen from a distance. Often what the visitor heads out to see on these occasions is something he or she passed right on by on the way to a prominence or an overlook. In essence, that’s what these botanical-garden projects are about to us: By creating multiple opportunities for engagement with the water and the landscape, we create situations that incline garden visitors to wander, pause, move forward, double back – and in the process see and learn things as they pass through wonderlands of visual information and delight. By making this work, we satisfy the regulars but always encourage occasional visitors to come back again when opportunities present themselves, setting the garden up with a sound revenue stream while members who show up monthly, weekly or daily will always be engaged, always keep exploring and always find beauty and contentment no matter what path they follow or how many times they’ve followed it. Next time: A small botanical garden that makes up for compactness with dazzling diversity. Raymond Jungles is founder and principal of Studio Jungles, a landscape architecture firm based in Miami, Fla. His prime inspiration and the key to his passion for landscape architecture stems from his longtime relationship with Brazilian artist and environmental designer Roberto Burle Marx, and his current practice is firmly rooted in Florida and the Caribbean basin with a focus on residential, resort and community design. For more information, visit raymondjungles.com.